A car designed for linguists... by linguists. The PM Lingo is the first affordable luxury automobile ever designed for linguists, by linguists. No one knows what a real linguist wants and needs in a car like the folks at Psammeticus Motors—more than just practical yet stylish transportation, the Lingo makes an important statement that only other linguists can fully understand—just like the best academic treatises. Stylish: The Lingo’s retro-chic typewriter-inspired body styling stands apart from the herd of cars driven by other academics in the humanities. Practical: The Lingo comfortably seats three linguists,1 with plenty of room in the trunk to store all your dictionaries and fieldwork notebooks. Theoretically Elegant: The Lingo uses a collection of re-orderable constraints to modify the automobile’s behavior to prevent you from accidentally violating any local laws. Playful: “Lingo”! Get it? It’s punny! Ling-Go! Ha! 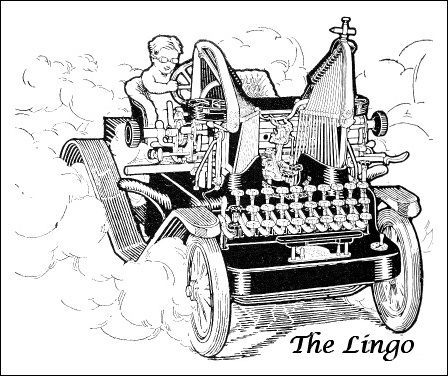 Serious: The Lingo, the only affordable luxury automobile for linguists that comes standard with end notes. 1 Seating in the Lingo may be limited to two, if they are big-headed syntacticians. 2 While the Lingo battery pack prefers to be charged in a linguistics lecture, a lecture by almost any academician will do, though charging times will vary by field. Mathematicians and Chemists give the weakest results, often requiring two lectures to reach full charge. In contrast, a single PoMo LitCrit lecturer can fully charge several Lingo battery packs in less than a half hour, though the power dissipates more quickly beyond the university walls. Your mileage may vary. 3 Namely that the complicated machine you are driving is having trouble beyond your ken. (We’re all linguists here—you can admit that your extensive and expensive training in the humanities has not prepared you to handle anything that goes on under the hood. It’s okay.) Your registered PM Mr. Goodword technician can provide the mechanical context needed to reveal the etic realization of any allo-problem. 4 State of the art NLP, including multi-lingual OCR, MT, and ASR, coupled with cutting-edge environmental sensor and GPS technology actually reads and understands road signs, computes the car’s current location down to the municipal level (noting as well the presence of colleges, universities, and other near-by refueling locations), analyzes traffic patterns and weather conditions, and parses shouted comments made by passengers and drivers of other vehicles to determine optimal driving speed. Support is provided for all natural human languages with more than one million speakers worldwide (based on the most recent Ethnologue estimates).